The Works Project Administration (WPA) provided opportunities for black artists to explore their creativity, gain access to new technology, and develop their artistic voices. Leslie King-Hammond will discuss the visual legacy of the WPA and printmaking pursuits by black artists in Philadelphia and other urban centers around the country. 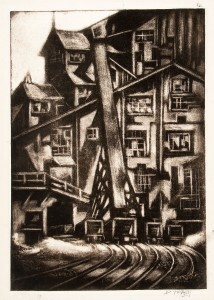 Presented as part of The Print Center 100. Lecturer: Leslie King-Hammond, PhD., Graduate Dean Emeritus and Founding Director, Center for Race and Culture, Maryland Institute College of Art. Woodmere Art Museum is housed in a 19th-century stone Victorian mansion in the Chestnut Hill section of Philadelphia. The Permanent Collection consists of more than 3,000 works of art, celebrating the art and artists of Philadelphia.